The primary message of this article is that astronomer need to put telescopes in orbit in order to study the wavelengths that don't pass through the Earth's atmosphere. This article also reinforces the idea of multiwavelength astronomy that was introduced in the 1955 Cosmic Times article, "Radio 'Ear' on the Universe Being Built". For thousands of years, the only form of astronomy observation was optical observation  the light we could see with our eyes. All telescopes, lenses and cameras were sensitive only to optical light. The 20th century saw the advent of astronomy in other wavelengths. Radio astronomy began in the 1930s (as we found in the 1955 Cosmic Times article titled "Radio 'Ear' on the Universe Being Built"), with the first sky-survey in radio wavelengths conducted in the 1950s. The subject of the main 1965 article, "Murmur of a Bang" describing the discovery by Penzias and Wilson of the cosmic microwave background, was done with an antenna sensitive to microwave wavelengths. There is a limit, though, to the portions of the electromagnetic spectrum that can be studied from the Earth's surface. Earth's atmosphere stops many wavelengths of light from reaching the Earth's surface  lucky for us, because many of these wavelengths are harmful to humans. However, this means that for the wavelengths stopped by the atmosphere, observations must take place above the atmosphere. X-ray wavelengths are among those stopped by the atmosphere, so must be observed above the Earth's atmosphere. The 1960s saw the birth of X-ray astronomy, with rockets, called "sounding rockets", to put instruments above the bulk of the atmosphere. 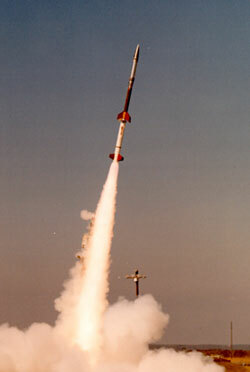 A "sounding rocket" is one that is used to perform research, and is named after the nautical term to sound, meaning, "to take a measurement". A sounding rocket has a typical science observing time of 5-40 minutes (in other words, the rocket remains above the bulk of the atmosphere for between 5 and 40 minutes, depending on the rocket and how high it flies). When astronomers first thought about X-rays from astronomical sources, the general opinion was that extra-solar sources would be too faint to be detectable. The first X-ray detector flown on a sounding rocket was set to look at the moon, under the idea that heavy particles from the sun would cause X-ray fluorescence of the moon's surface. They did not detect the moon. Luckily, it just so happened that an X-ray source was near enough to the moon that the detector could "see" it. This source is now called Scorpius X-1, because it was the first X-ray source observed in the direction of the constellation Scorpius. It was clear that Scorpius X-1 came from outside our solar system  disproving the idea that extra-solar sources would be too faint to see! This article discusses two specific X-ray sources in the sky, Taurus XR-1 and Ophiuchus XR-1. Early X-ray observations were named after the constellation in which they were found, and numbered in the order that they were discovered. So Taurus XR-1 was the first X-ray source found in the constellation Taurus. Similarly, Ophiuchus XR-1 was the first X-ray source observed in the constellation Ophiuchus. As previously mentioned, astronomers originally thought that cosmic X-ray sources would be too weak to be observed, so the appearance of numerous X-ray sources was a bit of a mystery. This article reports one of the first attempts to unravel the mystery, pointing out the similarity between the distributions of supernovae remnants in our Galaxy and that of the observed X-ray sources. This view was bolstered by the possibility of two X-ray sources coinciding with known supernova remnants. 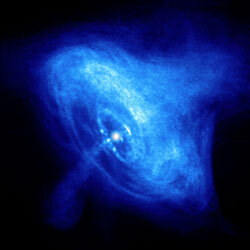 X-ray image of the Crab nebula as observed by Chandra. The details seen in this image are only possible with modern instrumentation  the original observations of the Crab would have been in the form of a spectrum, rather than an image. More information on this image available here. Image credit: NASA/CXC/ASU/J. Hester et al. Taurus XR-1 was conclusively tied to the Crab nebula  a remnant of the supernova of 1054. The Crab nebula is currently one of the most-studied objects in the sky, exhibiting emission at all wavelengths from radio to gamma-ray. It is unclear, however, if Ophiuchus XR-1 turned out to be from the remnant of SN 1604, also known as Kepler's Supernova. Ophiuchus XR-1 was only conclusively observed by one rocket observation. However, later observations did find X-ray emission from SN 1604. It is possible that the first observation was merely noise. We now know that supernova remnants can leave behind X-ray sources (neutron stars or black holes); however, supernova remnants are hardly the only source of cosmic X-rays. X-ray astronomy has grown since the 1960s, with several dedicated satellites, including the well-known Chandra observatory.